Sheffield Steelers' Rod Sarich. Picture: Dean Woolley. ROD SARICH believes Sheffield Steelers’ early start to the current season will only serve them well in the long run. With qualification to Europe’s Champions Hockey League secured with last season’s Elite League title, the Steelers began their pre-season earlier than normal in August. Normally, a couple of exhibition games would suffice ahead of the season proper in the UK, but the Steelers were given a baptism of fire with four tough CHL group games against elite opponents in the shape of Sweden’s Frolunda Gothenburg and JYP Jyvaskyla, from Finland. All four games ended in defeat, but there was a marked improvement in the Yorkshire club’s play as they went on, something which they carried over into the Elite League when the domestic campaign got underway, with eight wins in their first nine games. Since then, Paul Thompson’s team have stuttered somewhat with that early-season consistency proving elusive ahead of today’s trip to Braehead Clan – who also played in the CHL after finishing runners-up last season – and tomorrow’s visit from Nottingham Panthers. “I really enjoyed playing in the CHL,” said defenceman Sarich, now in his 10th season with the club. “It was nice to get into that high-speed style of hockey. Sure there was an adjustment but, as we went on, I felt we got better and improved very quickly. “As a result, I guess it does feel as if we’ve played a lot of games already and starting earlier like we did can work both ways. “But we’ve got a lot of depth and guys are – generally – staying healthy so, overall, I think it will be a big benefit having played in the CHL. 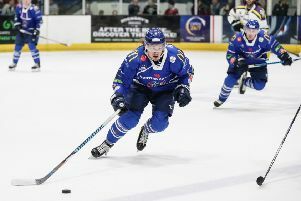 Sheffield Steeldogs are hoping to exact some revenge in the English Premier League on Roses rivals Manchester Phoenix when the two teams meet at Ice Sheffield tonight (7.30pm). Manchester got the better of their Yorkshire opponents with a 5-2 triumph when the two met across the Pennines towards the end of September. Tomorrow sees Greg Wood take his side on the road to Peterborough Phantoms. Hull Pirates will look to bounce back from their 11-0 thumping at the hands of Peterborough last Sunday when they travel down to Swindon Wildcats. Dominic Osman’s side – still searching for a regulation win in their debut English Premier League season – will host Basingstoke Bison tomorrow night (5.30pm).